. This material is irreplaceable in petrochemical and power plants where the usage of open flames is restricted according to safety regulations. Rizolin AS-2,5 – is used for installing and repairing roofs with a two-layered carpet as a lower layer; roof and wall waterproofing in combination with different insulation materials; waterproofing of foundations, swimming pools, soakage systems, basements, tanks; floor waterproofing; underground piping, isolation valves and heating lines etc. 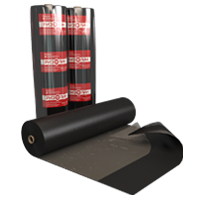 Rizolin AS-1,7 – is used for installing and repairing roofs with a two-layer carpet as a lower layer; as a vapor barrier. The material is made of durable reinforcing fiberglass cloth on both sides impregnated with bitumen-polymeric compound with targeted additives that improve its operating abilities. The material is absolutely waterproof, resistant to rapid temperature changes and mechanical influences; bioresistant. ATTENTION: Self-adhesive material properties are retained at an air temperature above +15 °С. At lower temperatures a little heat must be applied to the adhesive side till the appearance of high luster in order to ensue the adhesiveness (SNiP II -26-76*).